On Thursday evening the Atlanta Symphony Orchestra performed a concert of music by Singleton, Grieg and Sibelius at Symphony Hall, led by ASO music director Robert Spano and featuring guest piano soloist Louis Lortie. 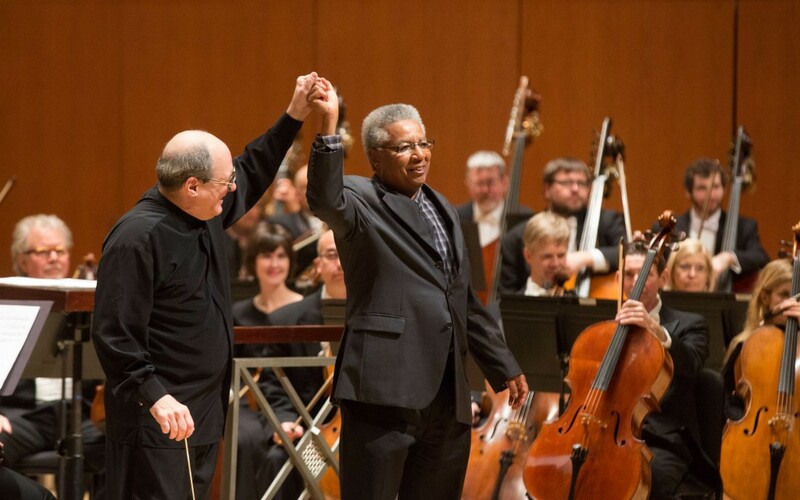 Brooklyn-born composer Alvin Singleton arrived in Atlanta in 1985 at the behest of Robert Shaw, ASO music director at the time, to become the orchestra's composer-in-residence. After the residency ended in 1988, Singleton decided to stay in Atlanta, and has lived and worked here ever since. This season marks Singleton's 75th birth year, which was celebrated last month in his hometown of Brooklyn's prolific experimental art venue, Roulette, on March 10. Singleton has consistently remained over the years Atlanta's most prominent composer on the national and international scene. Thursday's concert opened with Singleton's "Different River." This is the second time the ASO has programmed the piece, both times under Spano's baton. The first was its premiere four years ago. It is a piece in which all the ideas in the piece emerge and reappear in a variety of guises and transformations, though never exactly the same or in the same context. As with his other works, the title "Different River" is not meant to be descriptive. Nonetheless, there is metaphor, as in a saying attributed to the Greek philosopher Heraclitus, from which Singleton drew inspiration for the 25-minute work: "You cannot step twice into the same river." This performance by Spano and the ASO reinforced the impression left by the premiere: "Different River" is an engaging, impressive work by a seasoned composer possessing a distinctive, personal and creative voice. On Thursday evening the Atlanta Symphony Orchestra performed a concert of music by Singleton, Grieg and Sibelius at Symphony Hall, led by ASO music director Robert Spano and featuring guest piano soloist Louis Lortie. The program will be repeated on Friday evening at Symphony Hall before the orchestra heads off on Saturday to Savannah to perform the Grieg and Sibelius at the Lucas Theatre as part of the Savannah Music Festival. Brooklyn-born composer Alvin Singleton arrived in Atlanta in 1985 at the behest of Robert Shaw, ASO music director at the time, to become the orchestra’s composer-in-residence. After the residency ended in 1988, Singleton decided to stay in Atlanta, and has lived and worked here ever since. This season marks Singleton’s 75th birth year, which was celebrated last month in his hometown at Brooklyn’s prolific experimental art venue, Roulette, on March 10. Among a good handful of other performances of Singleton’s music coming this spring is the premiere of his “Prayer” for tenor solo, chamber chorus, organ, harp, trumpet and cello on May 22, to be conducted by James Conlon as part of the Cincinnati May Festival. Singleton has consistently remained over the years Atlanta’s most prominent composer on the national and international scene. Thursday’s concert opened with Singleton’s “Different River.” This is the second time the ASO has programmed the piece, both times under Spano’s baton. The first was its premiere four years ago. It is a piece in which all the ideas in the piece emerge and reappear in a variety of guises and transformations, though never exactly the same or in the same context. This performance by Spano and the ASO reinforced the impression left by the premiere: “Different River” is an engaging, impressive work by a seasoned composer possessing a distinctive, personal and creative voice.